is it really that time yet? i can't tell becuase i have been out of touch with the coldness for a while. is it time to be sad during the bleak months of winter already? will this advertisement for a japanese toilet cheer us up? what about all these nice songs that i have been listening to lately? i guess it's ok to be sad in the winter, as long as you pick the right tunes to nurse you along. my old time favorites are leonard cohen and tom waits' small change album (in my mind this is what christmas music sounds like). oh, and one year, the de la soul aoi bionics album sounded like christmas to me. but. it's definately not winter yet, so i'm going to be having none of that for a while. suggested reading for the winter time blues: banana yoshimoto- alseep. although this book has no aparent cheering effect, it seems to have the correct atmosphere, which is a highly significant aspect of enhancing any mood. why not feel properly sad? Pretty good list... but if ur listenin to a Buckley, you know 9/10 times it's gotta be _Tim_, right? "Lorca"? Thanks very much for putting that Princess Kitty inside Paul Wall's mouth out there... What's the story of that picture anyway? 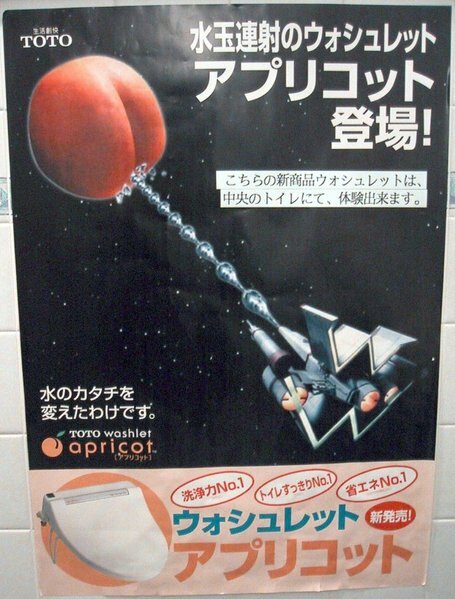 I'm cheered up by the toiletpaper ad. I'm also coincidentally listening to "So Long Marianne" right now. Thank you for the playlist.